Earlier this year, Kaneko began hosting a series of workshops called the Creative Catalyst Series. No More Empty Pots collaborated with Kaneko on a special activity on seeds, sowing and planting. The youth planted a variety of greens, garlic, carrots, peas, okra, watermelon and squash into trays that were placed on growing tower shelf. Youth from Civic Nebraska After School Program spent Martin Luther King Jr. Day sowing seeds and planting garlic as they learn more about where food comes from and how to eat healthier. 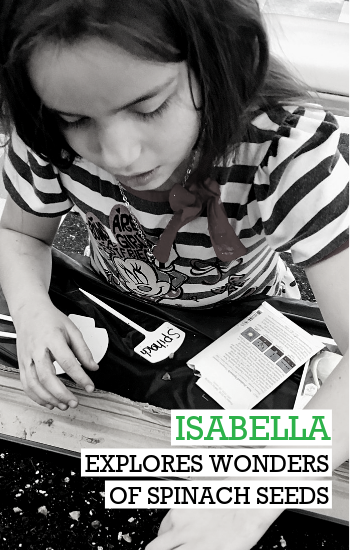 Isabella chose to sow the spinach seeds, carrots, garlic and peas. She was curious about the seed shapes and how they will grow. The spinach seeds drew a lot of attention and conversation with their knobby appearance. When the class was asked about why we were planting the carrot seeds in the deeper pots, Isabella shouted because they grow longer under the ground. Getting youth like Isabella excited about seeds, sowing and planting inspires curiosity, encourages healthy eating habits and empowers self-sustainability. The skills and healthy habits they learn can be taken home and spread throughout the household. Teaching our community to grow and eat their own food puts us one step closer to making sure no family goes hungry.